Synopsis: The Wind in the Willows tells the story of four anthropomorphised animals who live by the banks of the River Thames. Spring has arrived, the weather is fine, and the shy and friendly Mole has lost all patience with spring cleaning. Mole leaves his underground home and goes out to do some exploring. He ends up at the bank of a great river that he's never been to before and meets a brave and lively water vole called Ratty. The two become fast friends and spend a great deal of time together. Mole moves in with Ratty and they spend most of their days rowing on the river. Mole also meets a number of Ratty's friends. He meets a reclusive but kind Badger who lives in the dangerous Wild Wood and a flamboyant and vain Toad who lives at a grand estate called Toad Hall. As the year passes, the four friends have many adventures together and learn about the importance of friendship and loyalty. 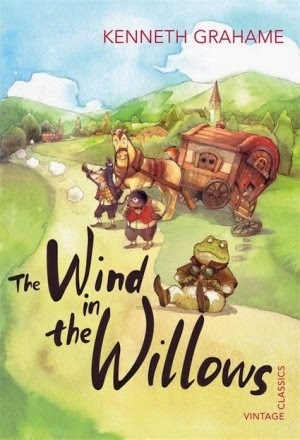 The Wind in the Willows is absolutely one of the best children's books that I've ever read. I didn't even read it until I was 21 but as soon as I did it became an instant favourite. If I'd read the book as a child then I'm sure I'd have been more entertained by Toad's various adventures but as an adult what I love the most about The Wind in the Willows is Kenneth Grahame's absolutely wonderful writing. His descriptions of nature are filled with so much wonder and awe and joy. I wasn't at all surprised when I found out that the book was a favourite of J.R.R. Tolkien's because Grahame's descriptions of the River Bank are so idyllic and dreamy that they give me very strong Shire vibes! :) The Wind in the Willows is a gorgeous novel. The writing is beautiful. The story is warm and funny and full of heart. The pacing is perfect. The characters are sweet and endearing and the book has lovely moral messages. Yes, I really love this one! Oh, and am I the only one who would love a Studio Ghibli adaptation? 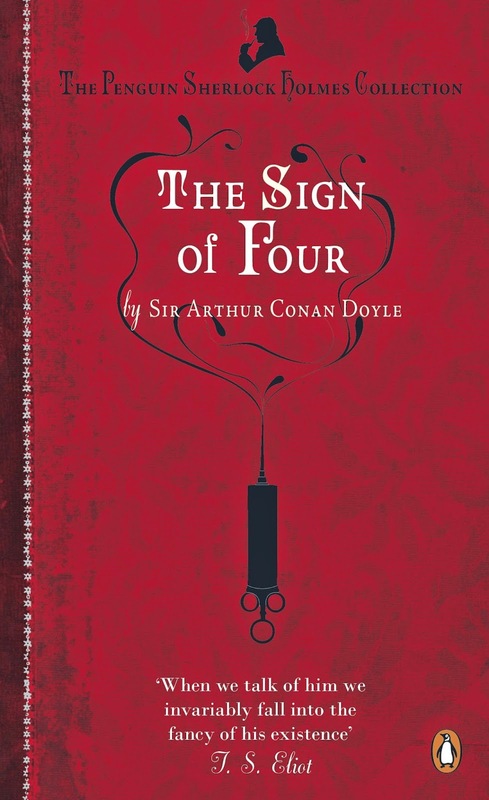 Synopsis: The Sign of Four is the second book in the Sherlock Holmes stories. Sherlock Holmes hasn't had a case in months and is bored out of his mind. With nothing to do, Holmes is now taking morphine and cocaine every day which is much to the alarm of his best friend and flatmate John Watson. However, it's not long before Holmes and Watson are approached by a beautiful young governess called Mary Morstan. Watson is immediately smitten with Mary and she has not one but two mysteries for Holmes to solve. The first is the disappearance of her father. Mary's father mysteriously vanished ten years ago and despite all of her best efforts no trace of him has ever been found. The second mystery is that for the past six years Mary has been receiving large pearls - one a year - from an anonymous benefactor. Mary has recently received another pearl but on this occasion it's come with a message, a letter which claims that Mary is a wronged woman and that if she wants to seek justice she must meet her unknown benefactor and bring two companions with her. Holmes and Watson both agree to accompany Mary but by the end of the evening the case has become even more complicated and a murder has been committed. In my opinion Arthur Conan Doyle didn't really hit his stride until he got to The Adventures of Sherlock Holmes. I can't think of very much that I can say about this book. The Sign of Four has some really enjoyable moments - like the boat race down the Thames - and it's an important story in the canon. Watson meets his wife, Holmes' drug issues are mentioned for the first time, and we find out about Holmes' skills in boxing and disguise. But just like A Study in Scarlet the murderer gets a tedious and interminable backstory that leaves me completely bored - and Mary is very underdeveloped. I started off reading some of the later Sherlock Holmes stories in which Mary is barely mentioned so I was really hoping that this novel would shed some light on her character but no, it doesn't. This is my second read of The Sign of the Four and I still don't feel as though I know Mary at all. Synopsis: The Empire Striketh Back is written in the style of William Shakespeare and is a retelling of Star Wars: The Empire Strikes Back. Three years have passed since the destruction of the Death Star but the civil war between the Empire and the Rebel Alliance is far from over. Lord Darth Vader is also becoming increasingly obsessed with finding Luke Skywalker. Luke is now in hiding and is living in the rebellion's secret base on the remote ice planet of Hoth - along with his friends Han Solo, Princess Leia, Chewbacca, R2-D2 and C-3PO. When the base is then attacked by the Imperial Fleet, the friends are forced into making a hasty escape. Han, Leia, Chewbacca and C-3PO escape on the Millennium Falcon and set a course for the Cloud City - a floating gas mine colony on the planet of Bespin which is being run by Han's old friend Lando Calrissian. They are unaware that Darth Vader has summoned several bounty hunters, including Boba Fett, to pursue the Millennium Falcon. Meanwhile, Luke and R2-D2 travel to a swamp planet in the Dagobah system after the ghost of Obi-Wan Kenobi instructs Luke to seek out the Jedi Master Yoda. Luke then begins to receive intensive training in the Force. Ian Doescher's Verily, a New Hope was one of the funniest books that I'd read in years so I knew I had to read his retellings of The Empire Strikes Back and The Return of the Jedi sooner rather than later! I must admit that I didn't enjoy The Empire Striketh Back as much as I did Verily, a New Hope. One of my absolute favourite things about Verily, a New Hope were all of R2-D2's asides. R2-D2 still gets some asides in this book but nowhere near as much as in Verily, a New Hope. Leia was also much too lovey-dovey in her asides for my liking. I've never imagined Leia being as conscious of her feelings for Han as she seemed to be in this. But still, this book was a delightful read and it has some wonderful comic moments. I loved that Doescher gave the Wampa and the Exogorth soliloquies and that he continued to incorporate famous Shakespearean quotes into the story. Doescher also brings in more Shakespearean literary devices into his series which I appreciated. This time around he relies less on the chorus to explain the action scenes and has the characters describe the action for themselves more. He puts a few songs into the story and he breaks away from the iambic pentameter and rhyming couplets in places. Boba Fett speaks in prose rather than verse. In his afterword Doescher writes that this is because Shakespeare would often have his lower-class characters speak in prose as a means of distinguishing them from the higher-class verse-speaking characters. He also has Yoda speaking in haiku! 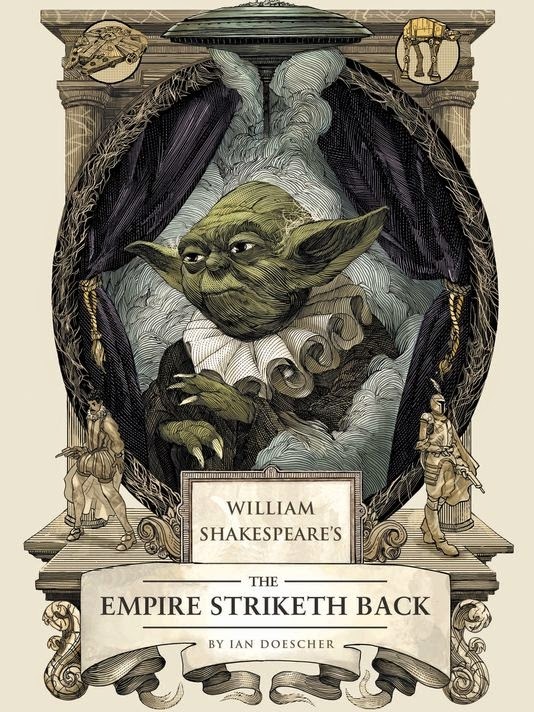 Doescher acknowledges that Shakespeare never used haiku but explains that he needed to find a way of making Yoda sound sufficiently different from the other characters and figured that since Yoda has a little bit of an eastern sensei sensibility to him that the use of haiku would be fitting for the character. William Shakespeare's Star Wars is a great series and it really is a must-read if you love both Shakespeare and Star Wars. I'm looking forward to The Jedi Doth Return. I'm very interested in finding out what Doescher does with the Ewoks! I'm going to have to reread The Wind in the Willows. I read it when I was like 12 and didn't care for it at all, but people like you keep praising it, so I should try it again! I actually own a copy, so I will dig it out and put it on my TBR shelves!